I got this roll polished off fast. It’s “freezer-stored” Tri-X that expired in 2000; I thought it would be nice to shoot some of the old stuff from before Kodak restructured the film, but I can’t say I’m happy with this particular roll, it does not seem to have been stored as well as I was led to believe, and I’m trying to find ways to minimize the fogging. 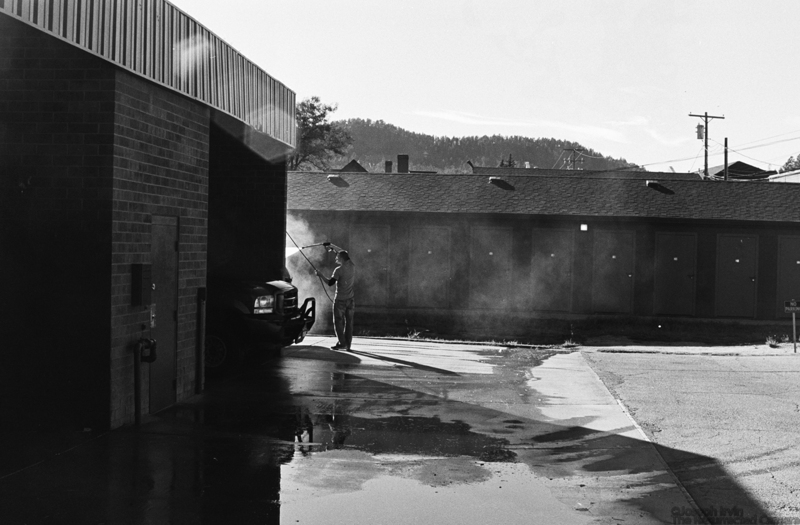 This was developed in D-76 stock solution for 10 minutes at 66F. It’s hard to pick just one image. 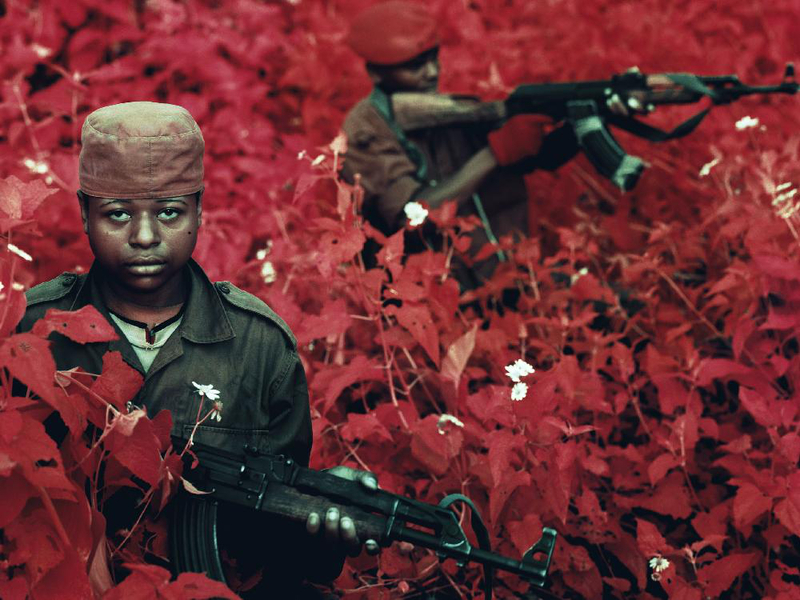 Richard Mosse was interested in bringing the attention of the world to a series of civil wars that have been happening in and around the Democratic Republic of the Congo (Zaire) since the late-1990s. 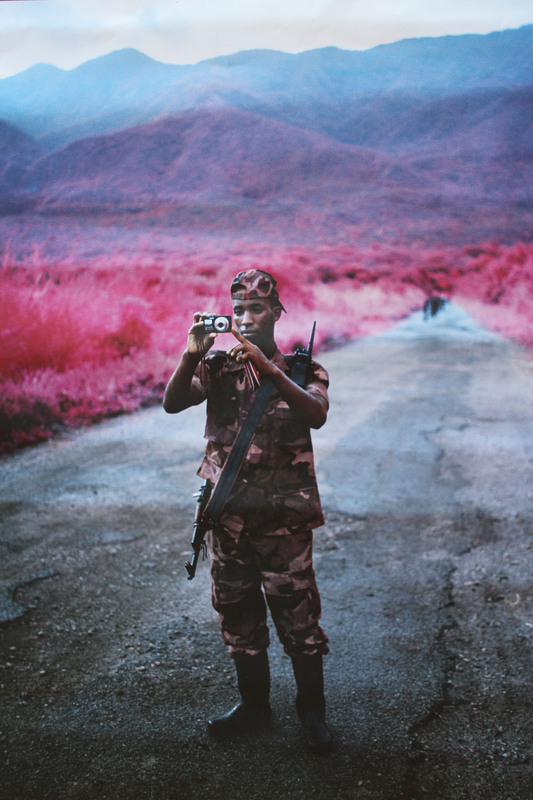 Mosse shot most of the series on large format 8×10 and 16mm motion picture cameras (working with a dedicated cinematographer), using discontinued and expired Kodak Aerochrome EIR film, which was an infrared color reversal film developed for the US military for aerial reconnaissance and camouflage detection, and produces incredibly wild colors in vegetation. The Lomography movement has really embraced the aesthetic of this particular film, and it’s unfortunate that Mosse’s series didn’t come out earlier, as the increase of interest and demand might have kept Kodak from axing it. 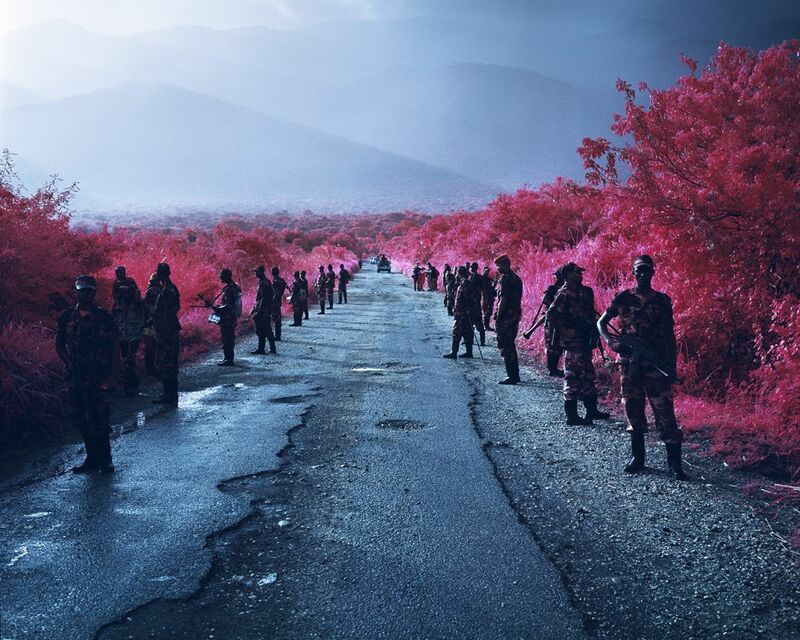 Mosse’s images really speak to the idea of uncovering things that are hidden, from the little-publicized civil war itself, to the original purpose of Aerochrome film. While Mosse shows us ground-level images and is right up in soldiers’ faces as opposed to impersonal and removed aerial survey, the effect is the same: we get to watch the conflict from a safe and secure place. I learned a new word today: reticulation. It basically describes what happens when there is an abrupt shift in temperature when developing a roll of film, for example when going from one bath to another. From what I can tell, it looks a lot like having exaggerated grain, except it’s a bit more uniformly placed, and circular. I don’t know enough about it to say if that’s what went on here, but I think I must have been a bit too sloppy when processing this particular roll. I think the film may have fogged a bit, which would mean I should have added more Potassium Bromide. On top of that, I might have pushed the film slightly without meaning to, or at least overdeveloped. The negatives came out denser and with much higher contrast than I’m used to. At least I kind of know what’s going on with it, and considering everything I try with this particular batch of T-Max makes it look worse, I’ll go back to what I was doing here, pulling one stop and developing in D-76. 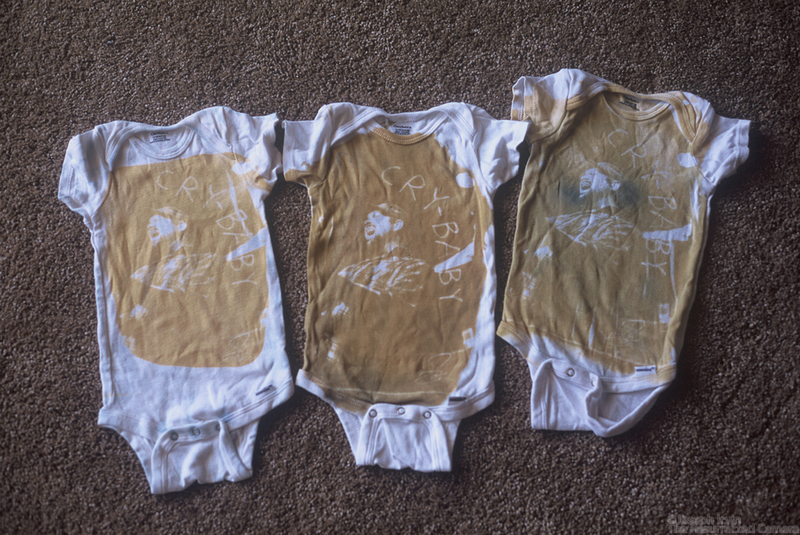 On another matter, my first results from using a short exposure roll didn’t go quite as well as I’d hoped. In fact, there’s almost nothing usable on the roll at all. Thankfully, it would appear that I don’t necessarily need to keep my weekly assignments completely separate from my larger class projects as I originally thought. I rushed through the rest of the roll in my Spotmatic and got it processed and scanned yesterday. 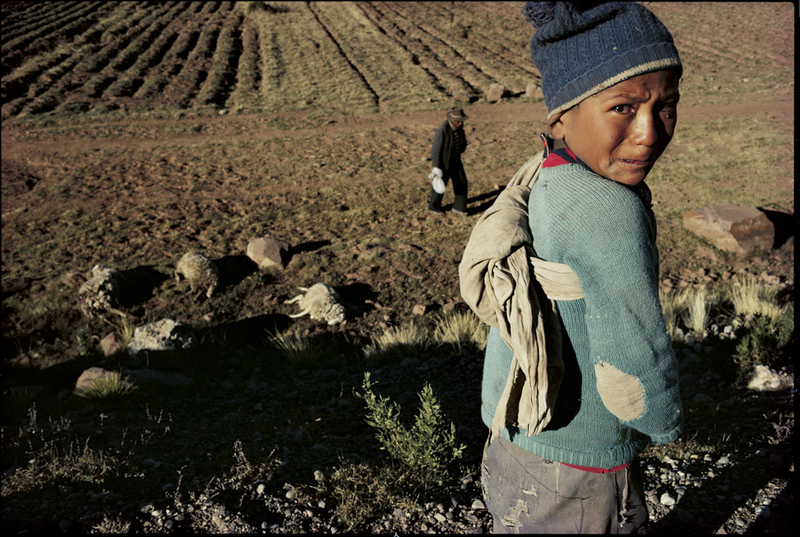 There’s something in the boy’s face that says: “Why are you pointing a camera at me now?” You can tell by his clothes how poor he is and how the loss of even a few sheep could be a devastating blow. I think in that situation, my first instinct wouldn’t be to take a picture, it would be to get in and help physically. Yet with the resources and reach of a magazine the size of National Geographic, as well as the compassion and generosity of its readers, taking that photograph helped that boy more than anything else anyone physically there could have done. There are alternating stories told of Allard’s portrait of Eduardo; another version is in the video you can see at this site. Fall 2013. We were to practice the art of being a flaneur and connoisseur of the streets, something I’ve come to enjoy more and more since. All I used to do was work and play video games, and even when I went on a hike, it was earbuds in and head down. These days, I take a camera with me almost everywhere, I stroll, I look at almost everything, and I learned to always have the camera cocked, the next exposure ready to go: you never know when that perfect shot will materialize. I remember we watched several videos, looked at plenty of pictures, all having to do with street photography, and how to really go about getting over fear, being able to just walk up to someone, put a camera in their face, and snap a shot before they knew what was happening. I’m still working on that, it’s about as far from my natural inclination as can be. I experienced a truly transcendent moment while out on one of my walks in Woodland Park: I had crossed three sides of one intersection, just killing some time, when a group of middle school girls appeared, capering up the street. The light was red and I was waiting at the cross section, they were coming from the other side of the street. My camera slung around in front of me, I made sure I was set for another shot, stopped down all the way and the focus set to take in as much of the action as possible. We all waited at the crosswalk together, myself and about a dozen tween girls. As the sign changed to “Walk,” the girls surged across the street towards Starbucks and a shot of caffeine they obviously didn’t need; I had the camera hanging down at stomach-level and when I was in the midst of the crowd I took my shot blind and as surreptitiously as possible, well aware of the cars stopped and the possible witnesses. I’d never felt like such a creeper in my life, some bearded guy in his late ’20s wearing an army jacket and taking pictures of middle school girls. I just hoped I’d escaped the notice of the stopped drivers, just brushed the camera, tripped the shutter release, casually kept walking up the street. I didn’t even wind the lever again until I was around the corner. Usually, it’s pretty easy to tell when I’ve captured a great image because it sticks in my mind hours and days after I’ve taken it, before I ever get the film developed, and this was definitely one of those times. Here’s my stuff. I walked around all week with a new lens on my Spotmatic, the Chinon 55mm f/1.7 macro. Or is that “macro?” There seems to have been some discussion over whether or not this is merely a close-focusing lens or a true macro lens. I’m still learning the difference myself, so I won’t comment here about it, but I think the lens has plenty of character, and I like the look, plus the price was right. Since I’ve carried around with me one of three normal primes over the last few months, each with their own pros and cons, I was wondering if the Chinon might give me the best options of being sharp, fast enough in low light, and with the ability to focus closer than I usually need. The jury is still out, but I’ll say that it’s hard getting used to focusing the opposite direction after spending so much time with the Takumars; that is my biggest gripe, but if it means missing the shot, it could be a big one. So far, I’ve been more than happy with the 1.8/55 SMC Takumar as my everyday lens, but the Chinon is at least an acceptable alternative. It occurred to me after I posted a week ago, that as far as waiting for the perfect shot, there’s another really iconic photograph that should be talked about, especially in the context of concerts since that’s what I shot a lot of the last week, that also has a pretty good story behind it. From what I remember reading off Smith’s firsthand account, Simonon had been having trouble with his bass for a few songs at that point and had had just about enough. Smith had one last exposure left on her roll of film before she’d have to rewind, and instead of snapping something quick, rewinding, and loading a new roll, she sat on that last exposure. She could feel that something was about to happen, and it did; she was in the perfect spot to take a critical shot because she was attuned to what was going on around her, and decided not to waste a critical exposure on any lesser shot. And it paid off in a big way, becoming the cover to London Calling and one of the most iconic rock ‘n’ roll pictures of all time. 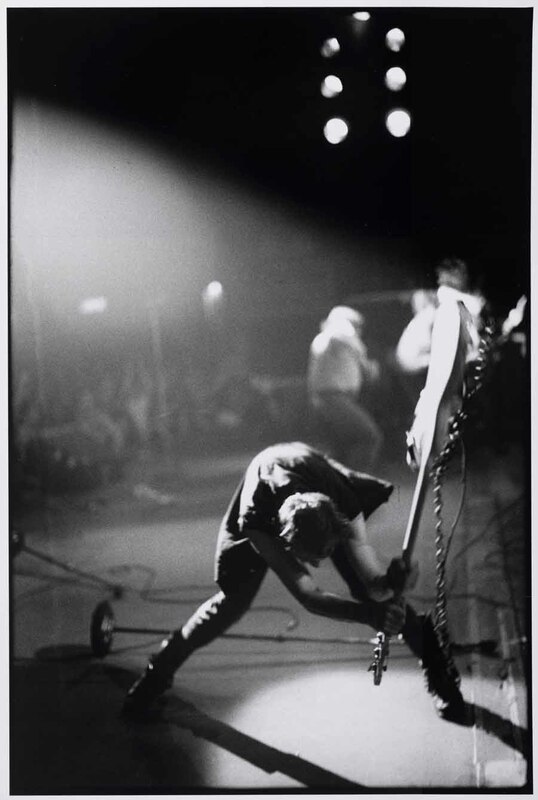 I can think of no photograph that better encapsulates the punk era’s rage and frustration, a teenage angst-driven rock ‘n’ roll for a new generation, as well as its level of naivete and penchant for destruction. It truly is a thousand words. Yesterday, our class was shown a mini demo of Ilford fiber paper vs. regular RC paper (also from Ilford). Besides learning that Ilford is considered more of a budget brand when it comes to paper, barely good enough to get by it seems, I’m also learning things about myself, maybe differences between my other classmates and me. Perhaps the difference is between those who major in photography and who are going on to make a living in photography after they graduate versus those who are only there because they like it a lot and are good enough to continue taking classes. We looked at the different prints (of the same shot) while they were still wet, which could have made a difference I’m told, but whereas everyone in the class was oohing and aahing over the differences, I could barely tell the two apart. It was a moment that was a bit surreal for me, as in my (music) composition lessons, I’m dealing with themes like individuality, marginalization, and sheep mentality, so here was the perfect opportunity for me to go against the flow and speak my mind, which I did…eventually. It’s hard sometimes, to set yourself apart from the crowd. The reactions were about what I expected (one guy jokingly asked me if I needed to get my eyes checked; now that I think about it, it has been a good five years since I last got my prescription changed), but what was somewhat frustrating is that they didn’t really hear what I was saying. Here’s where the differences were: I was coming from the place where I was saying, Guys, I’ll accept that there’s a huge difference, but I can’t see the huge difference, I can see a marginal difference, and I don’t even know if I have the training or experience to see what the differences are, and certainly couldn’t articulate it. Their responses all told me that what they heard was What’s the difference, what’s the point? And at some point, they all expressed amazement and disbelief that I couldn’t tell the difference. Guys, I can tell the difference: the fiber paper print had a bit more contrast in certain aspects; that’s about as much as I can see or articulate right now. Now, perhaps what they’re really saying is that they don’t hear a wide gulf between the two, but the consequent to their points is almost invariably, So why put in the extra effort/money? Mine, on the other hand, was really a lot closer to, I want to be educated, because I have too much experience with people who accept nothing that their own senses don’t take in; like someone with color blindness, I’m willing to accept the fact that there’s a vast difference that I can’t see. I hope someday that with further training and experience I will be able to see the difference. And until then, sure, I’ll still take the plunge to fiber paper. Not only will it be good for me to gain experience working with it, but it should help take my work to the next level. And hopefully one day, when I am able to see the difference, I’ll be able to look at my old work and appreciate it in a new way. Until then, just know that I’m doing it for you. -I didn’t have the film advanced to frame 1 for the first several months I shot it, and it took several months to get to frame 1 because I wasn’t winding it far enough, either (I really didn’t use it that often). -maybe I shouldn’t be leaving Ektar 100 lying around in a camera for a year before processing? -maybe before making any judgements, I need to shoot another roll. I remember that I didn’t always have any needle action when looking through the viewfinder, I just hoped for the best. I’ll also admit, I’m a bit rusty on color film now, and the fact that I didn’t have the Pakon’s color profiles really bummed me out. I scanned on the school’s Epson Perfection 10000 in the Visual Resource Dept. (I assumed that would give me better results than the V600s in the library), which took me about an hour for the 10 images that turned out. Then another couple hours in Photoshop trying to get the colors to look right (large blue cast, and I don’t think I got completely there with some of them, but I burned out, man). Ektar looks great when I can get it properly exposed, though why it wasn’t most of the time, still confuses me. Everything I’ve been able to find about the Fujipet says that it should use ASA100 film, but many of my shots came out really underexposed, and that was with me covering the selenium meter with my hand, telling the camera to give it the widest aperture it could. I have some Fuji Across in 120 that I bought with the express purpose of putting through this camera, but I’m wondering if I shouldn’t pick up something a bit faster, even going back to Tri-X, because the other thing I’m wondering is if the selenium meter is starting to go. 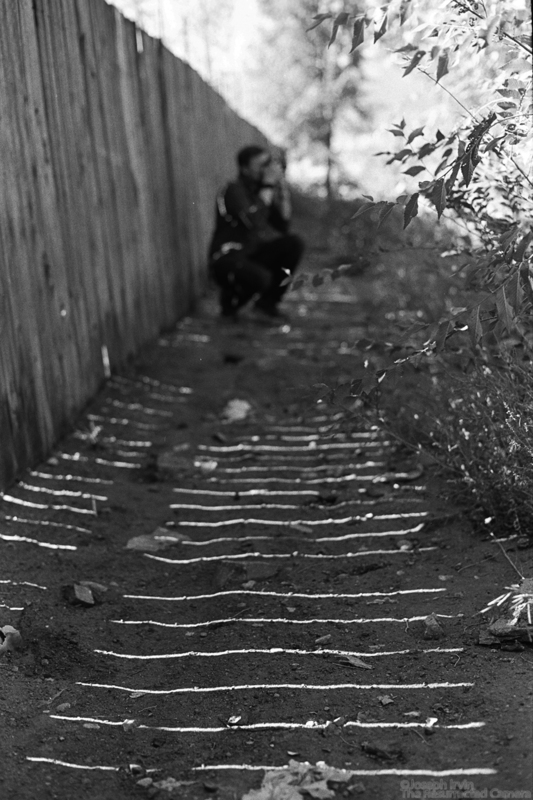 I do think, however, that I’ll put at least one roll of Acros through it, and I’ll make sure to shoot it on a sunny day. All complaining aside for a second though, I think the Fujipet has a pretty sharp lens, considering it’s plastic, and I can get plenty of detail on those scans when the camera shake doesn’t affect the picture. OK, I guess I’m not done complaining, after all. 1/50 second can be kind of hard to use handheld with the 70mm lens. I’ll have to attach it to the tripod next time.